Today is the last day of school for students in Worthington. But, learning cannot stop for summer break. Research shows that reading 200 pages per week – that’s only 29 pages per day! – increases student achievement and promotes cognitive growth. Kids that spend just 30 minutes a day over the summer reading, and then discussing what they’ve read, are better prepared when school resumes in the fall. Don’t worry, though, you’re not on your own when it comes to encouraging your child to read all summer long! You’ll have access to a number of exciting resources – including Raz-Kids – so your student can continue to listen to, read and record his stories, and continue building fluency and comprehension skills. Worthington Schools has partnered with Worthington Libraries to offer you and your child another important resource: booklists for students in kindergarten through high school! Lists will be available at all three library locations and online. This is a great time to mention Worthington Libraries’ Summer Reading Club, which starts May 31. Kids of all ages can read their way to free food and summertime fun, not to mention a chance to win some great prizes, by participating in the club, which runs May 31-August 2. We need help to keep your child’s reading skills moving forward. We know we can’t do it alone. As a parent, YOU are your child’s most influential role model and Worthington Schools’ most important partner. 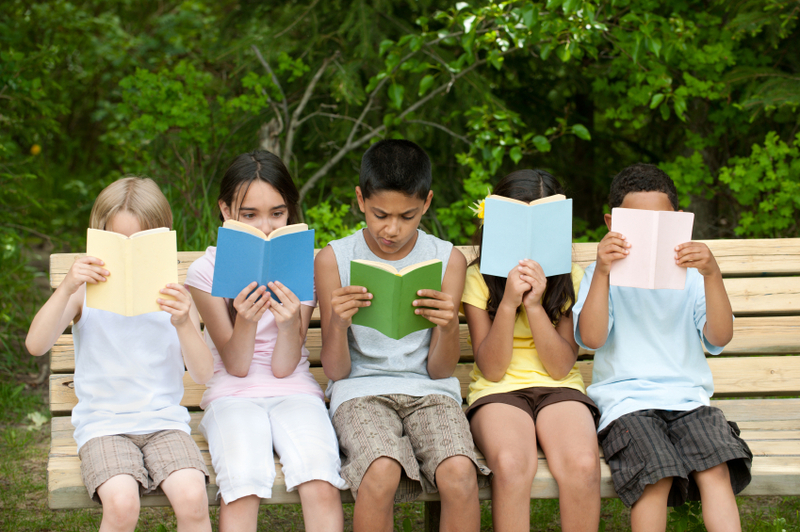 Talk to your child about a summer reading plan and, together, complete the form below. Then, get ready for a summer full of exercise for the mind and body! Along with the book lists, you will also find a Summer Instruction Plan & Partnership that can be used as resource for your students, community members, and your own families. Setting a goal and having a clear plan will ensure that students and our entire learning community keeps reading this summer! Additionally, you will find a link for “My Ideal Bookshelf.” This graphic organizer (By Jane Mount & Thessaly La Force) is a great way to think about yourself as a reader! The empty bookshelf should be filled by YOU! You can include the books you PLAN to read this summer or you can include your most TREASURED and favorite reads! I encourage you to post these shelves and let the world know you as a reader! 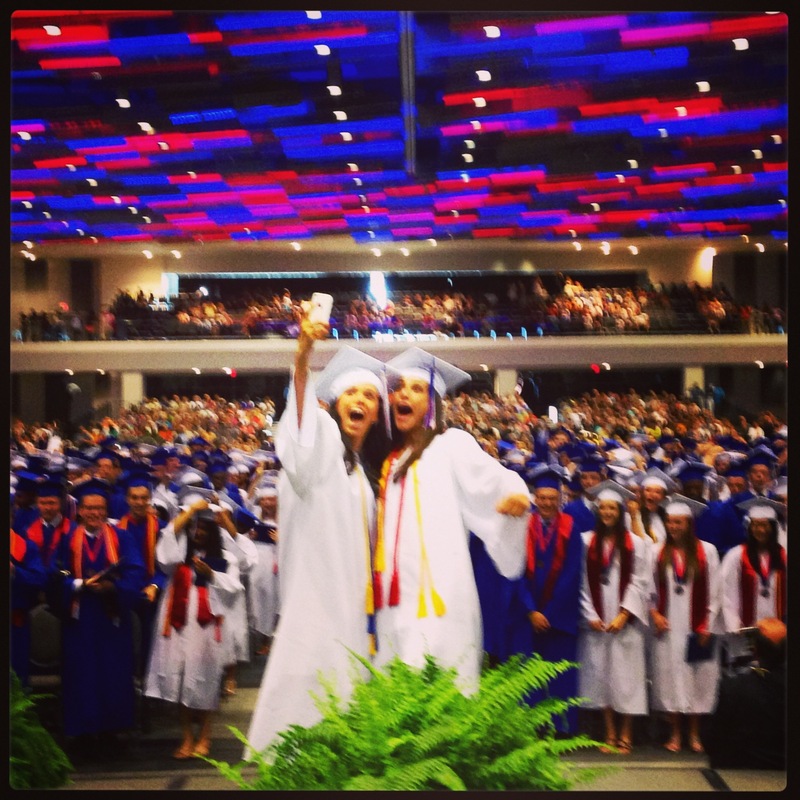 On Sunday 675 members of the Thomas Worthington and Worthington Kilbourne class of 2014 graduated from Worthington Schools. These graduates join the approximately 45,000 living alumni of Worthington Schools. Sunday was the 135th Commencement of Thomas Worthington High School and the 23rd Commencement of Worthington Kilbourne High School. Graduation is a special day. It is a day that marks great accomplishment. It is the end of an era for for special friendships and the beginning of a new and exciting phase for our graduates. At every graduation invited speakers share words of wisdom with the graduates. I found Board of Education President, Julie Keegan’s words to be most relevant on this day. Julie acknowledged the students’ success. As both a graduate of Worthington High School and as a parent of Worthington graduates, she knows first-hand how special this day is for everyone involved. She spoke of showing gratitude to those who made this day possible – gratitude to parents, grandparents, teachers, coaches, pastors, and special friends. No graduate arrived at this day on their own without significant help and everyone lucky enough to be raised in a community such as Worthington has much to be thankful for. Julie implored the graduates to express their gratitude. Gratitude was the theme but Julie’s message on this day was that gratitude alone was not enough. She told the graduates that they must express their gratitude without becoming complacent. They must continue to work to make their college, their workplace, their military unit, and their community better places. Gratitude is important but everyday is an opportunity to make a difference in the life of another human being and our graduates should leave Worthington “smiling because this happened” but also hungry to make their mark. 675 Worthington students have left our school district. They’re well prepared both academically and socially to succeed in the next phase of their life. Like many before them they’ve been molded in the long sloping halls of Thomas Worthington and by searching for the indoor pool at Worthington Kilbourne. As an alumni of Worthington Schools I’m proud to be associated with these graduates. If they express gratitude and guard against complacency they’re destined to make all of us proud. Several months ago we proposed creating The Worthington Academy to provide an alternative educational pathway for high school students in Worthington. I wanted to update you on the status of the proposed Worthington Academy which was presented to the Board of Education on March 24. You may view the presentation here. A team of teachers and administrators created the proposal based on feedback from key stakeholders as well as researching best practices. The concept was met with overwhelming support and enthusiasm; however there are still elements of the program that need attention before we make it a reality. Our initial plan was to make the Academy an option for secondary students beginning next school year. Given the adjustments that still need to be made, we believe that it will be a reality, but not until the 2015-2016 school year. 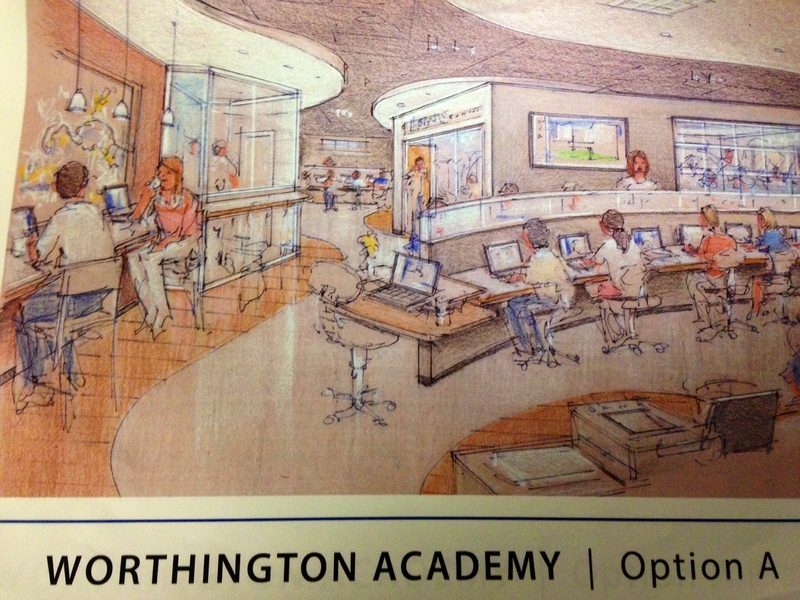 If you have questions about the Worthington Academy, please contact Jeff Maddox at jmaddox@worthington.k12.oh.us. Meeting students where they are is key to their social, emotional, and academic success. A piece of this puzzle is to allow them to be empowered in the learning process. We want to ensure in Worthington that we are teaching the whole child and providing each student a learning experience that meets his/her personal needs. Students are aware of their likes and dislikes, their own opinions, the things that they feel confident with, and the things that challenge them, as well as the dreams they have. Sometimes as adults we need to step back, let go, and empower our students to take charge of their own learning. When we are able to do this the results can be powerful. Several years ago a group of empowered high school students from Worthington Kilbourne High School created the student led anti-bullying effort “One Leg At-A-Time.” This group is dedicated to eradicating bullying in our schools. From this student led effort similar “One Leg At-A-Time” groups have formed in each Worthington school. As an outgrowth of “One Leg At-A-Time”, Evening Street 5th graders Zoe Hoctor and Peyton Bowers created their own anti-bullying campaign designed with Kindergarten to 2nd grade students in mind. Their presentation titled “Bully 101” helps our youngest students understand the difference between bullying behavior and behavior that is just “mean” and it provides students with strategies they can practice to stop these behaviors. On Tuesday, Zoe and Peyton were empowered by the school principal at Evening Street Mrs. Rykowski, and by a trusted adult ally, Mrs. Zook, to present “Bully 101” at an assembly of all K-2 Evening Street students. They fully led the assembly themselves. 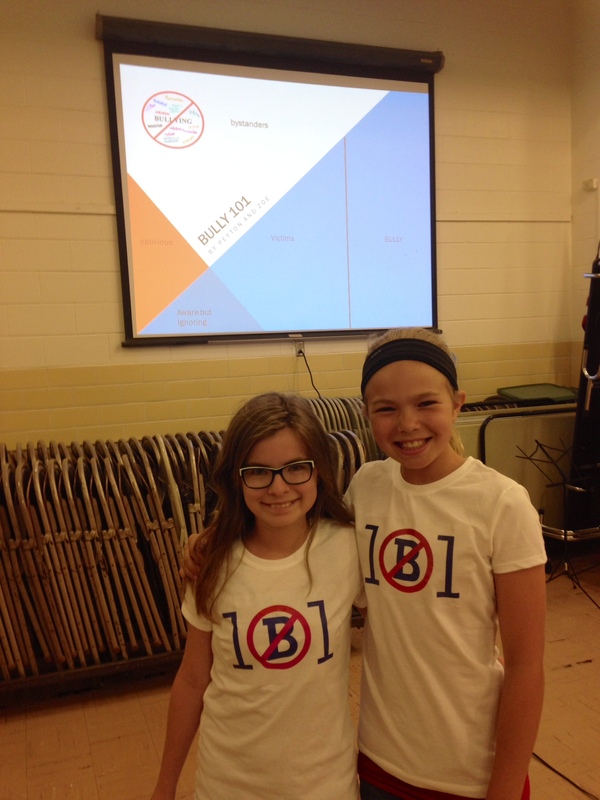 They dressed in their “Bully 101” t-shirts, they presented a PowerPoint presentation that they created on their own, and they solicited volunteers from the audience to help role play different situations that occur daily in our schools. It’s normal developmental behavior for youth to resist what adults have to say. However, they often listen and act on what their peers have to say. Thus, the groups “One Leg At-A-Time” and “Bully 101” have profound impact on our school cultures. Students and teachers working together create powerful learning environments that foster the success of all. We want our students to be engaged, challenged, and supported everyday they are with us. Empowering our students to take charge of their learning opens doors in all directions. As we celebrate the 30th anniversary of National Teacher Appreciation Week, I want to take a moment to inform our teachers and support staff how proud I am to be your colleague and congratulate you on the accomplishments of this school year. Your talent and dedication help pave the way for our students to excel throughout college, career and life. It is evident that you know the real value of teaching is inspiring students to read and think critically. Our district has achieved noteworthy successes this year: Worthington Schools was the only central Ohio school district and only one of nine in the state that earned all As’ on the state report card for Value-added; we earned our highest Performance Index ever, 104.1; and Worthington Schools earned some of the highest aggregate college placement scores in the nation. The changing landscape in Ohio education presents many complexities and Worthington Schools has stepped up to the challenge. You chip away with unrelenting passion and professional determination in wanting to advance our students and community. In spite of all of these challenges, you remain focused on our students. Each day, many of you make sacrifices as you fulfill responsibilities in and out of the classroom. Please know your benevolent acts of kindness and love for our students are greatly appreciated. Thank you for all that you do to impact our students and our community! In Worthington this week our students will be taking their Ohio Achievement Assessments. Hopefully, our students took it easy all weekend, rested their brains, ate healthy foods, and slept 10-12 hours each night. In my house none of the above happened. However, our students will test anyway this week and we expect them to do very well. They’re ready! In Worthington we refer to these tests simply as the OAA’s. But, the Ohio Reading and Mathematics Achievement Assessments are annual tests that measure how well students have learned the reading and math concepts taught in grades 3–8. The Ohio Science Assessments are annual tests provided to students in grades 5 and 8. These assessments are designed specifically for Ohio students and are based on Ohio’s academic content standards. They do not test a child’s intelligence or aptitude and are not meant to compare children’s abilities. The OAA’s were borne out of the federal No Child Left Behind Act of 2001 (NCLB) which required all states to establish academic standards that show what students should know and be able to do in reading and mathematics at the end of each grade. NCLB also required states to test all students in grades 3–8 annually in reading and mathematics to assess how well students are meeting the academic content standards. The results of the assessments are used to identify districts, schools and students that may require additional resources to meet state academic content standards. As a result, testing has become a major part of life for children and schools in the United States. The parody video at the top of this post (or this parody video for Frozen fans) shows how a school in another state had fun with this process. The achievement assessments ensure that families and teachers know whether each student has learned the reading and math skills and information expected at each grade level. The achievement assessments can also help identify specific areas in which a student needs extra support and practice. Teachers and families can then work together to ensure that a student gets the help that he or she needs. If a child does not score at or above the proficient level (a score of 400) on any of the assessments, this is an indication that he or she is having difficulty learning the skills and developing the knowledge expected of his or her grade level and may need additional help. Our teachers and principals will discuss the assessment results with families and will provide the resources that can help ensure a child’s success. Worthington teachers work very hard to align all of their instruction to the academic content standards and to formatively assess student learning all year long. Our teachers and our students partner to create classrooms and schools where there are high expectations for student learning. Great Students + Great Teachers = OAA Success! Today the calendar hits May 1st! For public schools in Ohio this is a significant date. It means we will have completed our first full year under the Ohio Teacher Evaluation System (OTES). In this system each of our teachers who sees students at least 50% of their day was formerly observed twice by their principal and two informal principal walkthroughs were completed. Principals then rated each teacher on a scale from Accomplished, Skilled, Developing or Ineffective. This portion of the evaluation system was deemed Teacher Performance. Teacher Performance accounted for 50% of a teacher’s final rating. The other 50% was accounted for by student growth data. Student value added data was used if a teacher resides in a grade level and subject where value added data is available. When value added data wasn’t available, teachers created student learning objectives (SLO’s) which set performance goals for each child in their classroom. In Worthington all SLO’s were written to assess academic and content vocabulary. Each teacher was then rated based upon their student data as Above Expected Growth, At Expected Growth, or Below Expected Growth. Using a matrix designed by the Ohio Department of Education the Teacher Performance and Student Growth ratings were merged to create a final teacher rating of either Accomplished, Skilled, Developing or Ineffective. These ratings will be complete for all Worthington teachers by May 10th. After living through this system for a complete year we have some “take-away’s.” First, the teacher rubric used by principals is a solid tool for moving instruction forward in our targeted areas. It has created thoughtful conversations between principals and teachers and it has reinforced our belief in formative instructional practices and differentiating for students within the classroom. The downside of the rubric is that it does a poor job of capturing the intangibles we care about. It doesn’t measure relationships and connections with students and families. It is a weak tool for measuring effective communication and extra effort. These are all things we value in great teachers. Second, from a student data standpoint our first year with SLO’s has been a learning experience. We believe our focus on academic and content vocabulary was a sound instructional strategy. We are excited to see how our students will benefit from this focus. On the contrary, it is probably a poor measure to determine teacher effectiveness. The simplistic nature of vocabulary was an ineffective read on a teacher good or bad. When final ratings come out, many of our teachers will be rated a notch above where their principal rated them. The student growth data reported by teachers and principals is coming out above expected for most SLO’s and therefore a teacher rated Skilled by his/her principal is determined to be Accomplished for a final rating. Some of our teachers see the opposite phenomena. Their final rating may be a notch below where their principal rated them due to student growth data. Thus, a nuanced view of a teacher’s evaluation is required to get a clearer picture of a teacher’s performance. As we move forward with this system we are redefining the role of the school principal. A much greater amount of the principal’s time is spent in the classroom evaluating teaching and learning. This means others in the school have to be available to meet with students and parents, do discipline, etc… No principal can do it all. Secondly, we’ll evaluate our SLO’s for next year. Academic and content vocabulary will remain, but our evaluation task force will need to determine how to raise the rigor of the assessments, or how to pair the assessment with another assessment to get a more accurate read on teacher impact. Completing year one of OTES is a relief. It’s a work in progress. As you can see, this year there were some good parts to the system, and some not so good. We’ll keep working to make Worthington’s system the best it can possibly be.